With careful consideration and exegesis, internationally known astrophysicist and Christian apologist Hugh Ross adds yet another compelling argument to the case for the veracity of the biblical commentary on the history of the universe, Earth, life, and humanity. Hidden Treasures in the Book of Job shows that the Bible is an accurate predictor of scientific discoveries and a trustworthy source of scientific information, and that both the book of Scripture and the book of nature are consistent both internally and externally. 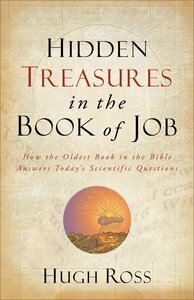 About "Hidden Treasures in the Book of Job: How the Oldest Book in the Bible Answers Today's Scientific Questions"